As a trial lawyer, Jim’s philosophy on litigation is based on integrity and hard work for his clients. True to his roots as a prosecutor, Jim values fighting for justice on behalf of those people harmed and always acts with a sense of urgency to hold wrongdoers accountable. As the youngest of six children born and raised on Chicago’s Southside, Jim learned the value of hard work and how to stand up for what was right. Blending his strong sense of social justice along with his work ethic shaped while working in his family’s restaurant and as a union railroad laborer, Jim became a lawyer to help people and his career proves just that. After attending law school, Jim served 14 years in the Cook County State’s Attorney’s Office where he proved to be an accomplished litigator in all aspects of trial work in the Illinois and federal trial courts and appellate courts. During this time, he routinely worked on complex matters, including wrongful death, highway negligence, civil rights, labor and employment, medical deliberate indifference/medical negligence, class-action, criminal and other significant tort matters. Jim’s hard-work, judgment, and successful results earned him recognition and trust by his colleagues, his bosses, as well as the Cook County State’s Attorney culminating with his accelerated promotion to lead two of the most complex and busiest litigation practice groups in the Civil Actions Bureau as Supervisor of the Torts and Civil Rights Division and Supervisor of the Labor and Employment Division. As a supervisor for six years, Jim actively litigated high-profile matters across a broad spectrum of legal issues as well as trained and mentored a staff of attorneys appearing on hundreds of state and federal lawsuits involving tort, civil rights, and labor and employment law. Prior to joining Clifford Law Offices, Jim most recently worked as a managing trial attorney for a national insurance company handling claims of injury related to construction, manufacturing, healthcare, professional services, premises liability, and auto accidents. Jim has tried more than 50 cases to verdict and hundreds of bench trials and hearings in federal and state courts. Notably, he proudly represented police officers from the Cook County Sheriff’s Office in civil lawsuits in federal court where he earned numerous favorable verdicts. 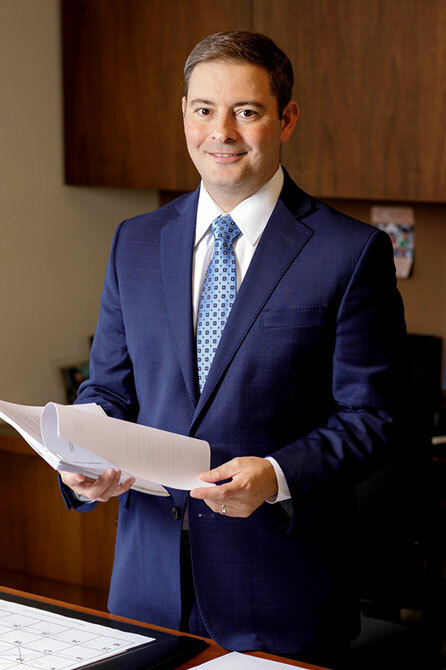 In addition to his broad trial work, Jim also proved himself to be a successful legal writer and appellate advocate where he has prepared numerous state and federal appellate briefs and presented oral arguments before the Seventh Circuit Court Appeals. Throughout his career, Jim has distinguished himself with tireless investigation and persistence in an effort to earn his clients the most just case resolution. He brings passion on behalf of those he serves and shares empathy with those victims of tragedy at all times. Jim was humbly honored when Mothers Against Drunk Driving (“MADD”) recognized him for excellence in the fight against drunk driving for his contributions toward the criminal prosecution and conviction of a drunk driver who caused a fatal accident resulting in the tragic death of an innocent husband and father. As an active member in his legal community, Jim has served as the Chair and Vice-Chair for the Federal Civil Practice Committee at the Chicago Bar Association. Jim recently served as lead coordinator of a national in-house practice group where he developed legal training in the area of workplace civil rights litigation. Jim currently resides in the Beverly-Morgan Park neighborhood on Chicago’s Southside with his wife and three children. Jim’s wife is employed with Chicago Public Schools and has spent her entire career working in the area of special education. Both Jim and his wife are active in their neighborhood community and their children’s grammar school.